Crispy Cauliflower Fritters are super addictive and a breeze to make! 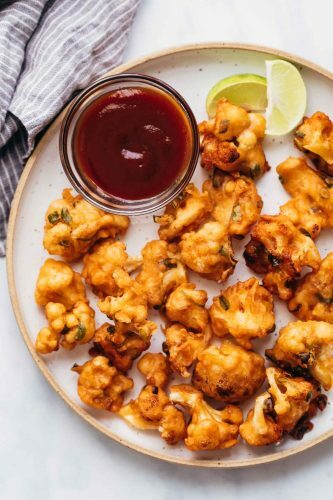 They are like a vegetarian version of chicken popcorn and taste great with some sriracha or ketchup on the side. If you are a fan of crispy appetizers, then also check out crispy baked parmesan ravioli, avocado fries, bacon broccoli cheese arancini and garlic parmesan cheddar chicken bites. I’m a sucker for everything crispy and deep fried. Like I can’t stop stuffing my mouth and I’m not sorry about it. 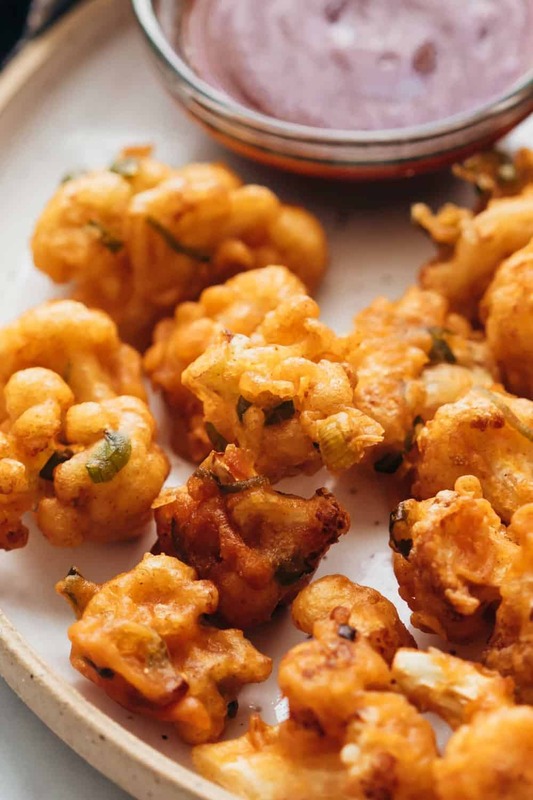 These cauliflower fritters are so crispy and tasty that you’ll need to make a double batch. They are coated in a really light batter with flour, rice flour, egg, spring onions and spices and deep fried till light golden brown. 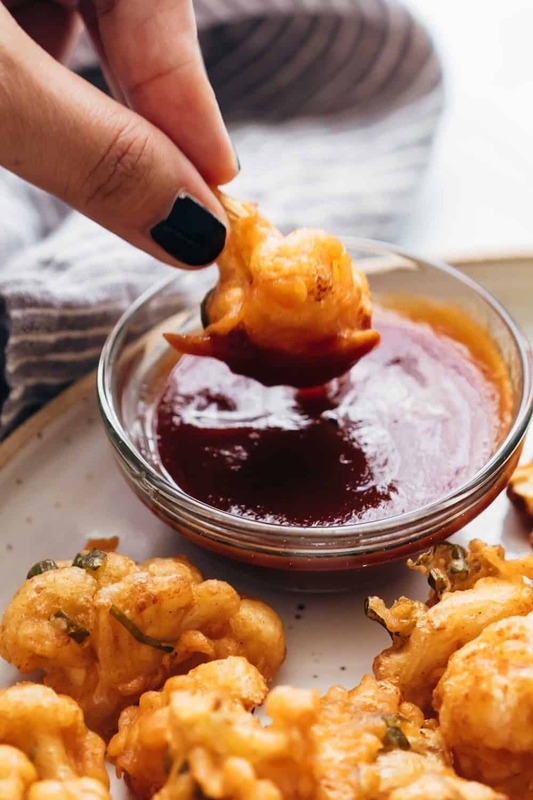 The rice flour is what adds that crunch to the batter in my opinion, so if you don’t have some in your pantry already, make sure you keep some and add it the next time you batter fry something. Cauliflower is notorious for being a difficult vegetable to clean because worms can find their way into small crevices. Which is why I recommend letting the florets sit in hot water for 10-15 minutes before you use them. This little trick will take care of any residual dirt or worms. How Do You Make Crispy Cauliflower Fritters? Pour boiling water over the cauliflower florets till they submerge completely and let this sit for 10-15 minutes. Heat oil in a skillet to about 350 degrees Fahrenheit. In a bowl, whisk together rice flour, all purpose flour, egg, spring onions, paprika, cumin, salt and a little water to make a batter which is slightly thinner in consistency than pancake batter. Batter coat individual florets and dip them in the hot oil, making sure not to overcrowd the pan or the temperature of the oil will come down drastically. Fry the cauliflower on medium high heat till they are golden brown and crisp. Remove them on a tissue lined plate and serve immediately. How do you make the batter for Cauliflower Fritters? The batter for these cauliflower fritters is really simple. We use all purpose flour, rice flour, finely chopped spring onions, an egg, paprika, salt and pepper. You can also add some dried herbs like oregano because they add an additional layer of flavour. Everything is whisked together with a little water to make a batter that’s slightly thinner than pancake batter and evenly coats the cauliflower florets. Since the cauliflower florets are cooked slightly in hot water beforehand, we don’t need to cook these for too long. 4-5 minutes of deep frying till these cauliflower fritters are a deep golden brown and they are ready. Which is why they make a fantastic last minute snack! Can I use other veggies instead of Cauliflower to make these fritters? Absolutely! You can make these with carrots, broccoli, potatoes (will need to be cooked longer) or even chicken or shrimp. I’ve made similar fritters by mixing together shredded, chopped vegetables and you can check out these pakoras here. Or if you are looking for something with chicken, but healthier, check out these coconut crusted chicken tenders. Love Cauliflower? Try these recipes too! Pour boiling water over the cauliflower florets till they submerge completely and let this sit for 10-15 minutes. Heat oil in a skillet to about 350F.